� 1989 British Ecological Society. 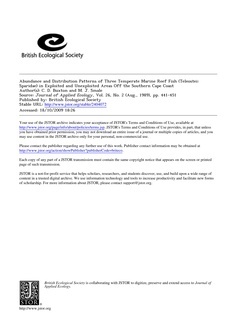 (1) Visual underwater census was used to determine the abundance and size structure of three conspicuous marine reef fish species, on the south-east Cape coast in 1984-86. Sites inside the Tsitsikamma Coastal National Park and outside the reserve at Cape Recife were compared to evaluate the effectiveness of the reserve as a management option for the fish. (2) Three sparids were studied: Chrysoblephus laticeps Cuvier, C. cristiceps Cuvier and Petrus rupestris Valenciennes. (3) Transect techniques suggested that point counts were best suited for mobile species and line counts best suited for more sedentary species that could hide within the reef. (4) Distribution within an area was correlated with depth and substratum relief, both factors reflecting feeding and habitat preferences of the fish. Fewer fish were found in shallow water and on flat reefs. (5) During cold upwelling, fish moved away from the study area, presumably following warmer water. Seasonal differences were observed in the abundance of C. laticeps; abundance was greatest in summer. (6) Sampling showed that the fish were significantly more abundant within the reserve, that there were more of the larger size-classes offish and that the maximum size offish was greater than outside the reserve. (7) The data suggested that the reserve is providing effective protection for species vulnerable to line-fishing.